Publix is the best! 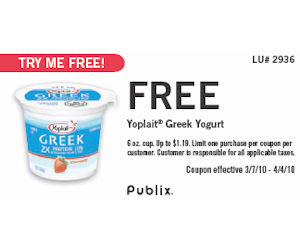 If you have a Publix grocery store near you, then go here to print off a coupon for a free yoplait greek yogurt. There is also a $1.00 off coupon for Chocolate Cheerios. Expires 04/04/10.